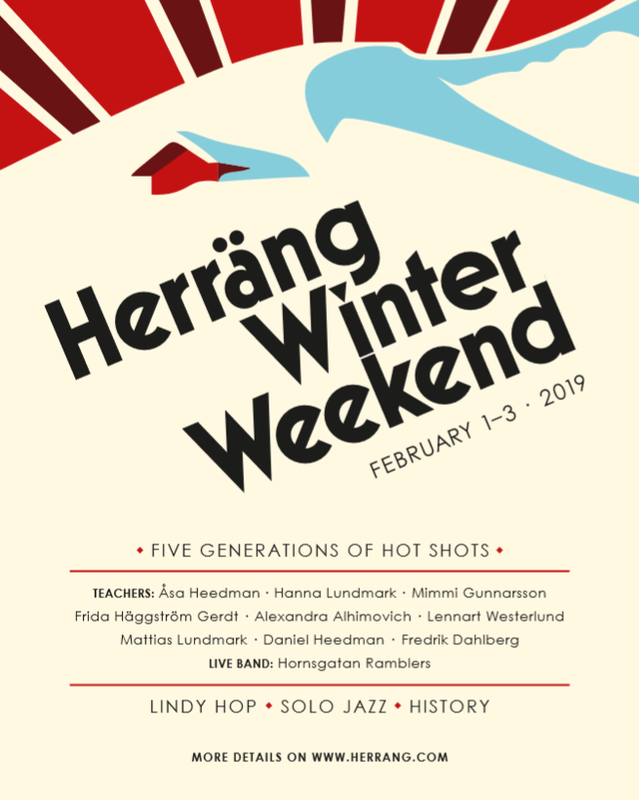 Welcome to the second edition of Herräng Winter Weekend, February 1-3 2019! Ten hours of classes including Lindy Hop, Solo Jazz and film presentation. Three class levels: BeginnerIntermediate/Intermediate, Intermediate/IntermediateAdvanced and Advanced. Two social dance nights, including one evening with Stockholm based swing band Hornsgatan Ramblers and a small show by five generations of The Rhythm Hot Shots/Harlem Hot Shots! The courses are fully booked. Registration is now closed. During the weekend, we will show recently discovered and previously unseen film material (Larry Schulz collection)of old-school dancers demonstrating and performing different swing dances during the early days of the revival. There are two accommodation alternatives available for workshop participants: General or Private. General Accommodation offers bunk beds in the school dormitory. WC and showers are to be shared. Mattress, pillow and cover will be available and you only need to bring your own beddings. Private Accommodation offers different alternatives in either Woodside (already fully booked) or in private houses around the village. WC and shower are to be shared in Woodside, and variates for each of the private alternatives. We are currently looking for additional private alternatives in the village. If you are interested in booking private accommodation please email your requisites to accommodation@herrang.com and we will see if we have anything available for you. Please note that single rooms are often difficult to find in Herräng. For evening guests only paying single entrances, there might be available beds in general accommodation. Please contact us for availability. The meals will be served in Folkets Hus and consist of either a vegetarian or vegan option. The included meals are breakfast, lunch and dinner on Saturday and also breakfast and lunch on Sunday. Café Blue Moon will also be open, focusing on light snacks, fruits and traditional Herräng fika. The weekend starts on Friday evening with a mutual get-together class, followed by a late night social dance with deejay Frida Häggström Gerdt. The level based classes will be held on Saturday and Sunday. Saturday will end with a short dinner show by the teachers followed by a social dance to the swinging live band Hornsgatan Ramblers whos speciality is to play real swing music in a truely partyish setting. 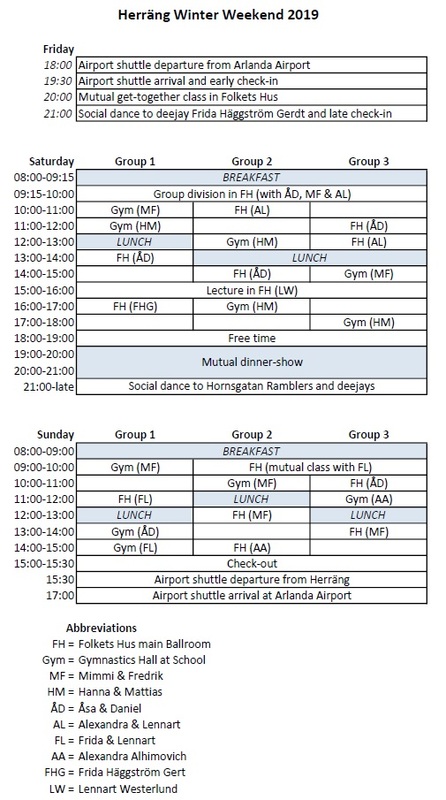 Please find the detailed schedule of the weekend below.